Yesterday some of our candidates came to the beautiful Stage-USA office for a pre-departure orientation. 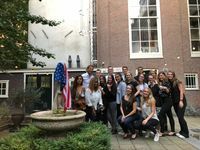 After a presentation about what to expect and what is expected in the USA, everyone moved to the garden for some drinks with networking opportunities. We want to thank all these wonderful participants for making the pre-departure event a great success. We are confident that you will do great in the USA!